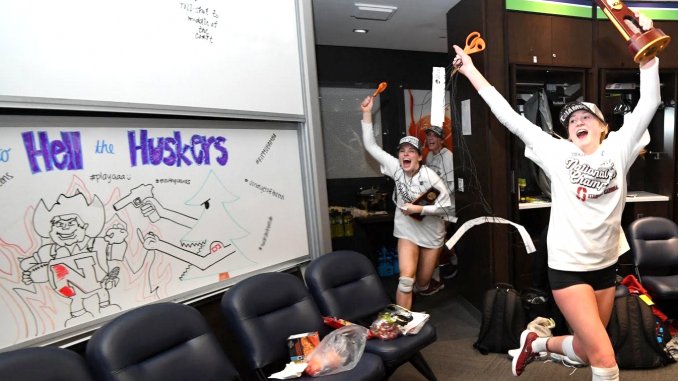 Members of Stanford’s volleyball team return to their locker room on Saturday night, and a photographer took this picture of their whiteboard that sparked a controversy. NCAA Volleyball photo via Twitter. Stanford’s NCAA-record eighth national volleyball title was overshadowed Sunday by an apology the school’s athletic director issued for a drawing on a whiteboard in the team locker room. The drawing depicted Stanford’s tree mascot pointing a gun and flipping the bird toward Nebraska’s Huskers mascot as players jubilantly entered the room on Saturday night at the NCAA championships in Minneapolis. A photo of the scene was tweeted by @NCAAVolleyball and then deleted. But others picked up the photo, and it went viral. Reaction on social media by Nebraska fans was mostly hostile, though some said that people were overreacting to the photo. “I don’t think there are any drawings in Nebraska’s locker room of Stanford players getting shot by Herbie,” wrote @CrooksSteve. A Nebraska Athletic Department representative said the school had no comment. In the championship match, Kathryn Plummer finished with 19 kills and 10 digs, Morgan Hentz had a career-high 32 digs and freshman Holly Campbell added a career-high 15 kills for the Cardinal in a five-set victory over the Huskers. “They put up an amazing fight,” Plummer said. “I don’t know that I’ve been part of a match that was more interesting, more hard-fought,” said Cardinal coach Kevin Hambly, whose team’s record this season was 34-1. What tree? What gun? What flipping bird? All I saw was a happy girl RUNNING WITH SCISSORS!! Didn’t these girls have Mommas? Give this PC crap a rest. Let “kids” be kids. Way to ruin these girls’ best day! I hope the losers are happy.